If all you know about Bobby McFerrin is his 1988 pop hit "Don't Worry, Be Happy," you don't know Bobby McFerrin. That song was just a blip in his long career as a composer, conductor, and vocalist with a 4-octave range "on a good night" (as he said in the Q&A portion of the show). I saw him in concert for the third time last night; the first time was six years ago, and I also saw him a few years ago with the vocal ensemble Cantus. In his solo shows, Bobby's alone on stage with only a microphone, a chair, and a bottle of water. He creates an entire world of music with nothing but his voice and body. He can do things with is voice that I've never heard anyone else do. 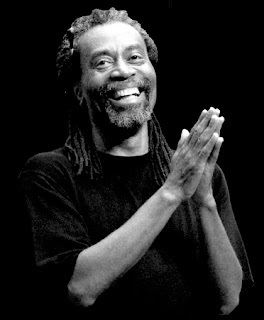 But the best part about a Bobby McFerrin performance is the pure joy with which he performs, and that he brings out in everyone watching him. Bobby's concerts are the most interactive concerts I've ever been to. He gets the audience to sing along with him and directs them like a choir. At one point the audience sang "Ave Maria" while he provided the rhythm. Usually you don't have to ask me twice to sing at a concert, but I draw the line at "Ave Maria." Fortunately there were some people in the audience much more talented than I, and it sounded lovely. In both solo shows I've seen, he also invites the audience on stage to sing and dance with him. Last night about a dozen people went up to dance with him, from amateurs and children to people who obviously had some training in dance. They'd improvise a dance while he improvised the music, both parties reveling in the joy of the music. He also sang duets with a few many people, asking them to sing whatever song they wanted while he accompanied them. He did this part a little differently when I saw him six years ago. Instead of asking for volunteers, he went out into the audience and would go up to someone and start singing a few bars until they sang along with him, and then he'd improvise around them. I was sitting near the front next to an empty seat on the aisle, so I had a feeling he'd choose me. And he did! He had me sing a simple three-note melody, and then he sang along with me. I can clearly remember singing with him and looking into his eyes, feeling the joy. It was a beautiful moment. Friends, if you ever get a chance to see Bobby McFerrin sing anywhere, with anyone, at any time, take it. I promise you won't be disappointed. It's always a joyous occasion.